Winter means snow, and here in Pennsylvania it can mean a lot of snow. This snow, particularly if it is wet and heavy, can mean problems for the roofs on buildings and homes. Fortunately, there’s a calculation that’s done when building roofs that takes snow into account. The East Stroudsburg area receives nearly 40 inches of snow each year, according to Sperling’s Best Places. 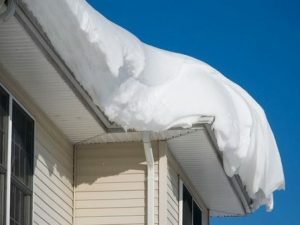 As this snow piles up on roofs, it can become very heavy. In some cases, the snow load may exceed what the roof can safely support, which can result in costly structural damage to the building. Roof snow load is calculated using a formula to determine how much the snow weighs per square foot. This formula is used when designing roofs to ensure that the materials used and construction methods can support the additional seasonal weights, but this same formula can give you an idea of how much the snow on your roof actually weighs. The formula starts with the ground snow load, which can be determined by carefully collecting snow from the ground to be weighed. Snow in the Pennsylvania area can weigh 30 pounds per square foot or more. Wet snow, or repeated melting and freezing cycles, can increase the weight per square foot, although typically more snow blows off on a roof. The second step in the formula is to consider the exposure of the roof. Values are assigned based on whether the roof is completely exposed or is sheltered by trees or other structures. The more exposed your roof is, the more snow will be carried away by wind and the more sun will strike your roof after the storm clears, improving the speed of melting. The third step involves calculating the thermal factor for the roof. The thermal factor will vary depending on whether the building is heated or unheated. Last, you must calculate the roof slope factor. Roofs with a steeper pitch are able to withstand more snow because the snow tends to slide off the roof quickly. The roof snow load can be calculated by multiplying 0.7 x Ground Snow Load x Exposure Factor x Thermal Factor x Roof Slope Factor. The easiest and safest way to make sure your roof will be safe this winter is to contact a roofing professional. Having your roof inspected periodically is the only way to be sure it is in good condition and ready for winter weather and is the best way to identify early signs of structural issues or leaks that could allow moisture to get inside and damage your structure. At Roofing by Bruce, we know what winter is like in Pennsylvania. We can perform an inspection on your roof and alert you to any potential issues before they become a larger problem. Contact us today by calling 570-424-7250 to learn more about our services or to schedule a roof inspection for your home or business.